Wet blocking is an easy way to work with natural fibers, but for acrylic, it often isn’t enough. Blocking acrylic with heat is commonly referred to as “killing” acrylic. It’s a handy thing to know how to do, and it’s important to do properly because once it’s done, it can’t go back to its original shape. Blocking is great for getting the edges or shaping you want on a project, and stretching the acrylic while blocking can actually give a finished project more drape. Killing acrylic with heat works with the fact that acrylic is plastic and it melts and deforms when heat is applied to it. You are manipulating the fibers while they are in a more manageable state. It’s much different from wet blocking or heat blocking wool and other natural fibers, which is more akin to wet setting or heat styling hair. Prepare your work surface and project. I like to use a towel in case there are any mishaps, plus I find it works well with or instead of a blocking board. If you have blocking pins and want your project to have a certain shape, especially one with crisp corners, pin the edges down. For some projects, you may just want to block in sections and let the weight stretch the fabric the way you want. For things you want to flatten (for example, circles that are a little too floppy or edges that curl), have another towel or some other fabric ready for pressing. Start at the synthetic setting on your iron and hover the iron over your work as you work your way up through the settings until you find one that is sufficiently hot but won’t damage your fabric. 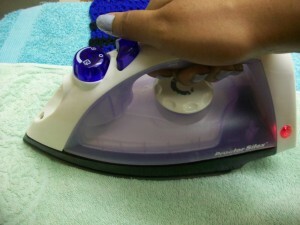 Avoid contact between the iron and fabric. The acrylic can melt and you can end up with a ruined project and a ruined iron. If you are flattening a project, cover with a towel or other cloth and press your project for a few seconds at a time, checking it often. You may use the steam setting while killing the acrylic and let the heat from the steam do the work, if you prefer. It pays to be patient and careful when blocking acrylic to avoid ruining all your hard work and/or your iron, and if you need help before you start the process yourself, feel free to leave a comment below. This entry was posted on Friday, March 9th, 2012 at 9:55 AM by Candace	and is filed under Tutorials and Help. You can follow any responses to this entry through the RSS 2.0 feed. You can skip to the end and leave a response. Pinging is currently not allowed. I didn’t know blocking acrylic was possible! Although the term “killing” has kind of discouraged me from doing so. I “kill” all baby garments made from acrylic yarns as it leaves the fabric incredibly soft without changing the fabric otherwise. Try it first on something small, maybe a wash cloth for baby, and see what you think. I did some regular blocking for my acrylic the other day and it seems to have worked fine. although i’m wondering whether it will shrink back to its original state now that it is no longer pinned. you think it’s worth the time for me to try this method of blocking also? If it doesn’t go back to its original state now, it probably will after a wash. If you heat block it, the results are permanent. Well this came up on facebook at just the right time! I have spent the last 2 weeks making a gorgeous cardigan out of acrylic (I like to test out a pattern in acrylic to make sure it fits right and is flattering before I go spending money on expensive yarn) and was going to wet block it today. I’m now going to steam block it instead 🙂 Thanks! Even if you’re going to keep the sweater you’ve already made, you might want to try it on for fit before you kill it. Killing acrylic is different from wet blocking natural fibers in that it actually changes the fiber itself instead of temporarily making it behave. I just recently killed a couple of acrylic scarves. I love the way the yarn looks after, kind of muted and the hand changes. Thanks for the reminder that I should do another one soon. could you post an “after” photo to show the effects of this method? I’ve done this before with scarf, but never a larger piece. Have you tried this on a blanket? 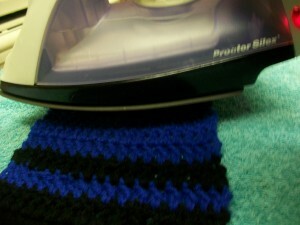 I’m using Vanna’s Choice, and want a really uniformed look for the edges of a baby blanket I’m making. & as asked for previously…do you have any before and after pics? That would be so helpful…thanks! I am finished a scarf that is 25% merino wool and 75% denier (I think that’s the spelling?) acrylic. Can I wet block, or should I kill it? Thank you sooooo much for this bit of advice/info. I didn’t realize that you couldn’t wet or starch block acrylic. I have put ALOT of time into a certain project and would have HATED it and been very sad if I couldn’t get it to lay right. I will submit photo when finished. Thanks again!! A lot off crocheters have bit upon a concern of mine. After putting in considerable time into the construction of an interim we don’t want out ruined. I guess we won’t get a before and after picture buggy I believe it will work. I am tunisian crocheting an edge to a sweater and its curling up. I would like to block it but not sure if i should use killing method or wet blocking. Any suggestions? What is the fiber content of the yarn? If it leans more toward natural fiber, I would try wet blocking first. For a high acrylic content, I’d go with heat. Its caron simply soft. The label reads 100% acrylic. I was under the impression that “killing” the yarn was when you touched a hot iron directly TO the yarn. Simply steam blocking it is not “killing” it. Killing happens when the acrylic is heated enough that it begins to melt and stretch. That can happen with or without steam. I’ve crocheted for many years but, I’ve never made (then steamed) an acrylic Infinity Cowl (scarf ) before. I’m assuming I lay it in the way it is to be worn, then steam on top side, wait to dry, turn over completeIe other side. Is this correct? If it isn’t, do you have any tips that may help me steam this Infinity Cowl better? Normally, for a scarf, I’d lay it flat along the length of the ironing board. For a cowl (if it was made in the round or has already been sewn closed), I prefer draping it around the ironing board and doing it in sections to avoid creasing.